Halitosis, bad breath, is not a core health problem in itself but it can have a major impact on your life. It is also an indicator that there are other problems with your health and body that need to be addressed. Haliosis has been the cause of many relationships falling apart. People you have been close to who move away from you. Relationships that show promise but then end will a silence and no return phone calls. 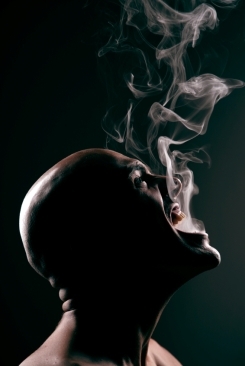 People wonder why and, although it seems incredibly petty, the answer is surprisingly often linked to halitosis. The problem is that it is not socially acceptable to be telling people that their breath smells so bad and many people who suffer the problem are not aware that they have it. The reality is that it is common in many people all the time and in all of us at some times. A common cause of halitosis is bad teeth and gum conditions. Dental decay at the roots of the teeth may result in abscesses in the gums with foul-smelling, pus giving an objectionable odour to the breath. Even small holes in the teeth may provide a place where germs can multiply and release foul orders. Other causes of halitosis are any conditions of the nerves, throat, respiratory tract, or stomach which are associated with chronic infection or local upsets of one sort or another, such as chronic tonsillitis, lung diseases like chronic bronchitis and bronchiectasis, chronic gastritis and sinuses which cause a discharge at the back of the throat. Most cases of bad breath., however, are caused by gastro-intestinal disorders, intestinal sluggishness and particularly by chronic constipation. The unpleasant odour results from an exceptionally large amount of waste matter expelled through the lungs. Chewing pan and tobacco and smoking are other causes of bad breath. The diseases like anemia may also lead to unpleasant breath. If halitosis is caused by tooth and gum conditions, tonsillitis, sinusitis, smoking or anemia, these conditions must be treated. Once they are eliminated the bad breath will disappear. Similarly, bad breath resulting from gastro-intestinal disorders can be successfully treated by correcting these disorders and cleansing the system of morbid matter. The patients suffering from halitosis should take a well-balanced diet consisting of seeds, nuts and grains, vegetables and fruits, with emphasis on raw and cooked vegetables and fruits. A fully balance nutrition supplementation program can have a major impact on this problem. In case of constipation, all measures should be adopted for its eradication. The patient should avoid reined carbohydrate foods, such as white sugar, white bread and products made from them as well as flesh foods and egg. Even whole grain bread should be eaten sparingly. The patient should also avoid over eating of any kind of foods. The teeth should be cleaned regularly twice a day especially before going to bed at night. Meat particles should be removed carefully with toothpicks. Munching a raw apple or guava after lunch removes most of the trapped particles. In some cultures the use of twigs of the margosa (neem) tree as are used instead of a tooth brush and it is considered to be the best method of cleaning the teeth. With dental hygiene it is critical to keep your mouth and teeth clear to avoid bacteria from even starting to build up in your mouth. If you have a dental problem, especially in the case of decaying teeth and swollen and bleeding gums, a dentist should be consulted. If the halitosis comes on when you normally don’t experience it then there is a chance that it is related to a serious health problem internally. In this case watch for any other indications that there are problems and treat the halitosis as a warning sign. If other symptoms present themselves then it may be time to get to your doctor and find out what is going on. Among the several home remedies for halitosis coming from Asia are a number of recipes from India that many people find very effective. If someone has constipation and that is contributing to his bad breath then he should eat six to eight soaked prunes and a few dried and soaked figs with breakfast. He must also drink the water in which these fruits were soaked. He should also take plenty of liquids and drink six to eight glasses of water daily. This will help eliminate bad breath. The use of fenugreek has proved most effective. A tea made from the fenugreek seeds can be taken regularly to assist in correcting the condition. This tea is prepared by putting a teaspoon of seeds in half a litre of cold water and allowing to simmer for 15 minutes over a low flame. It should then be strained and used as tea. Another effective remedy for bad breath is the use of avocado which is far superior to any mouth lotion or remedies for this condition. It effectively removes intestinal putrefaction or decomposition which is one of the most important causes of bad breath. If someone has constipation a person should eat six to eight soaked prunes and a few dried and soaked figs with breakfast. He must also drink the water in which these fruits were soaked. You should also take plenty of liquids and drink eight large glasses of water daily. The unripe guava is useful in halitosis. It is rich in tannic, malic, oxalic and phosphoric acids as well as calcium, oxalate and manganese. Chewing it is an excellent tonic for the teeth and gums. It helps cure bleeding from gums due to stypic effect and stops bad breath. Chewing tender leaves of guava tree also stops bleeding from gums and bad breath. Parsley ( prajmoda) is valuable in the treatment of bad breath. Two cups of water should be boiled and several springs of parsley, coarsely chopped, should be stepped in this water along with two or three whole cloves or a quarter spoon of ground cloves. This mixture should stirred occasionally while cooling. It should then be strained and used as a mouth wash and gargled several times a day. All fruit and vegetable juices are beneficial in the treatment of halitosis and should be taken liberally by those suffering from this disorder. Juices from fruits like apple, grape-fruit, (chakatora), lemon and pineapple, and vegetables like tomato, carrot and celery are especially beneficial. The person suffering from bad breath should take plenty of exercise as lack of sufficient exercise is one of the main causes of constipation leading to halitosis. 1. Dental problems – You should visit your dentist. If it is decay then you need specialist help. If it is a gum problem though then improving your overall wellness and giving your body the nutrition tools it needs to fight the problem could make a huge difference. 2. The onset of a chronic health problem. If the problem with halitosis has come on suddenly then you need to be watching for other signs of health issues and get medical attention if it looks like you have a problem. 3. Overall problems with your digestion and general health. This area is one that can normally be sorted out with proper use of nutrition products. I will go through the options that are available using the Herbalife range of nutrition products. Firstly we need to see if your digestive system is healthy. If you have problems with your digestive tract, diverticulitis, colitis, stomach ulcers, Crone’s disease, irritable bowel of any of the other myriad of terms that refer to different problems with different parts of the digestive tract then the quickest way to make a difference is to use some Aloe vera juice. Aloe will clean through your digestive tract and trigger a very gentle detoxification. It is a bit like giving your body a shower on the inside. Aloe is also famous around the world for promoting healing. Where ever the aloe is in contact with raw and damaged skin and flesh it sooths the area and leads to healing. If your digestive system is having problems and you add aloe vera juice then very often there is significant improvement in a short time, weeks or even days. As you bring the problems under control you will find that the halitosis will normally improve dramatically. ADD GEORGE KNIGHT ULCER STORY. The problem may go deeper than a specific medical condition causing bad breath. If you are not digesting your food then you should look at using a core nutrition program to clear the toxins out of your body and to rebuild your bodies capacity to absorb nutrition from what you eat. Here is a great article that explains the process of how we absorb our food and why this area has become the underlying cause of much of the health problems in our modern world. If is well worth taking a few minutes to read it - Nutrition For Your Cells. Temporary fixing of Bad Breathe. SITE DISCLAIMER: Do these products “cure” anything? Of course not… but it stands to reason that if you cleanse your body and feed it the finest nutrition available, giving it everything it needs in balance, on a daily basis, that your body will do what nature intended, and give you the best possible chance to fend off sickness and disease. This Halitosis information is not presented by a medical practitioner and is for educational and informational purposes only. The content is not intended to be a substitute for professional medical advice, diagnosis, or treatment. Always seek the advice of your physician or other qualified health provider with any Halitosis questions you may have regarding a medical condition. Never disregard professional medical advice or delay in seeking it because of something you have read. The Halitosis resources on this site are not intended to be a substitute for professional advice. While all attempts have been made to verify information provided in this publication, neither the author nor the publisher assumes any responsibility for errors, omissions or contrary interpretation of the web site Halitosis subject matter herein. The site Halitosis contents are solely the opinion of the authors and should not be considered as a form of advice, direction and/or recommendation of any kind. If expert advice or counseling is needed, services of a competent professional should be sought. The author and the Publisher assume no responsibility or liability and specifically disclaim any warranty, express or implied for any products or services mentioned, or any techniques or Halitosis practices described. The purchaser or reader of this publication assumes responsibility for the use of these Halitosis materials and information. Neither the author nor the Publisher assumes any responsibility or liability whatsoever on the behalf of any purchaser or reader of these Halitosis materials. There is no guarantee of validity of accuracy. Any perceived slight of specific people or organizations is unintentional. This website and its creators are not responsible for the content of any sites linked to. Since natural and/or dietary supplements are not FDA approved they must be accompanied by a two-part disclaimer on the product label: that the statement has not been evaluated by FDA and that the product is not intended to "diagnose, treat, cure or prevent any disease."